The curriculum at St. Thomas More Catholic Preschool includes the Catholic faith, as well as areas of art, math, literacy/language arts, dramatic play (social studies), large muscle equipment, manipulative toys (fine motor), musical equipment, science material and physical fitness instruction. Our program uses theme-based units to teach the goals and objectives of the Early Childhood Curriculum Guidelines. The focus of our preschool is the further development of social skills and the introduction to basic math and literacy concepts, as well as music, science, art, and of course, the Catholic faith. These concepts are introduced through relevant themes and involve play, teacher-directed learning, group time, individual expression and multi-sensory activities. Children will attend Mass or visit the Church on a regular basis. St. Thomas More Catholic Preschool operates on the traditional school calendar, from September (Labor Day) through May (Memorial Day.) St. Thomas More Catholic Preschool follows the STM Catholic calendar for Christmas and Spring Breaks, as well as for snow closures. St. Thomas More Catholic Preschool is open Monday through Thursday. 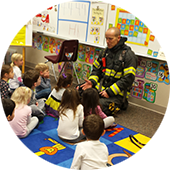 STM Catholic Preschool complements its exceptional curriculum with educational activities such as book fairs, visits from local firefighters, monthly Mass and more.